Today's post is a collection of my favorite Latino-themed ornaments on the web. I've been so pleasantly surprised by the creativity and the ingenuity that has gone into making them! I especially like how these can be given as gift sets, or used to decorate your own tree. And I think every child might love to make their own versions of these ornaments. 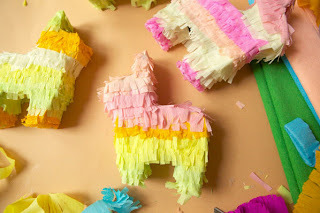 Ruby from Growing Up Blackxican recently shared her miniature posada piñata ornaments on Spanglish Baby. They are adorable and easy for your children to make. Oh Happy Day also teaches you how to make some adorable mini-piñatas. I think they could easily be made into ornaments with a little bit of yarn or twine. These are a little more complicated and probably best suited for older children. First Palette has a simple poinsettia ornament craft that I really like. 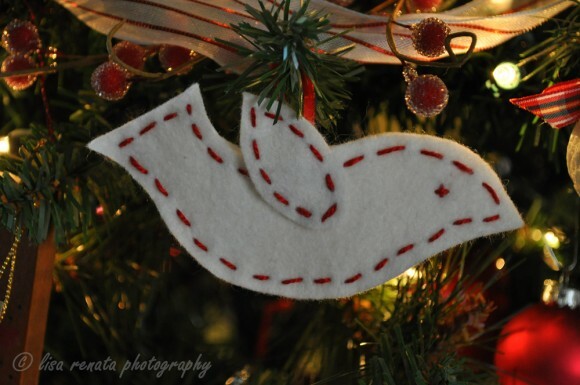 I'm thinking of having the kids make some of these using tiny, gold bells in the middle. I also like these stained glass poinsettia ornaments made out of paper towel tubes on the Crafty Crow!! Gorgeous, no? My friend, Lisa, who recently created a tutorial for MommyMaestra on making your own traveling nacimiento, has also created a tutorial for New Latina on making felt ornaments.